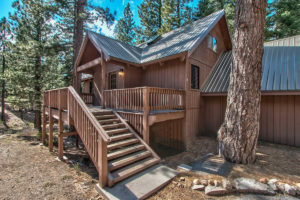 Home > New Listing in Northstar! Wonderful mountain living – gorgeous upgrades and fine-finishes throughout this 4 bedroom, 4 bath Northstar home. This property offers vaulted ceilings, lots of windows and three sunny decks, allowing one to fully immerse in the surrounding nature! If you are not on the deck barbecuing on the long summer evenings, find yourself relaxing in the inviting living room next to the beautiful fire during the colder winter days. Great trail access right outside your door, with house backing on forest service land and a trailhead just steps away for summer hiking or winter cross country skiing.